BATON ROUGE — Making his first public appearance since being elected to the Louisiana Supreme Court, Associate Justice-elect Jeff Hughes told the Ronald Reagan Newsmaker Luncheon that he intends to stand for the principles he ran on and to bring higher ethical standards to the court system. Hughes carried 53 percent of the vote Dec. 8 in the eight-parish district by campaigning on strong conservative themes, including being pro-life, pro-gun, and pro-traditional marriage. Hughes, a Republican, emerged from the eight-candidate field along with Democrat John Michael Guidry. Both are members of the Louisiana 1st Circuit Court of Appeal. Republican voters struggled through the primary, as they tried to choose from among five Republican judges who sought the post. Looking back on the primary, one can easily see that Hughes should have been viewed as the front-runner all along. Only two candidates in the field had a strong base to run from. Guidry was strong with African American voters in Baton Rouge and the River Parishes, while Hughes had a strong geographic base in Livingston. Most of the primary candidates were from Baton Rouge, and their base was heavily split. Hughes’ challenge all along was to put together his base in Livingston with two conservative areas that had no candidates in the race — Central and Ascension. He also had to run strong, although not necessarily win, South east Baton Rouge. In the primary, Hughes did all of that, placing him in the runoff with Judge Guidry. In the Dec. 8 runoff, Hughes knew that his new base — Livingston, Ascension, Central, and Southeast Baton Rouge — represented just over 50 percent of the vote. He had to turn out that base as least as well as Guidry turned out his. In the runoff, Hughes earned 89 percent of the vote in Livingston, 86 percent in Central, 69 percent in Southeast Baton Rouge, and 62 percent in Ascension — more than enough to win a big victory. For Republicans, it was a significant win, which gave them a 4-3 majority on the Louisiana Supreme Court for the first time in state history. Republicans now have every statewide elective office except U.S. Senator, five of six Congressmen, and a majority of the state house and senate. At the Reagan luncheon, Judge Hughes thanked voters and introduced retired Judge Darrell White, who spoke on the Harlan Bible and America’s Christian heritage. In 1906, U.S. Supreme Court Justice John Marshall Harlan donated his personal Bible to the Supreme Court and asked the other members of the Court to sign it. After that, each new member of the Court signed the Bible. And the signing of the Harlan Bible became part of the ritual that each new member performs. For more than 100 years, the custom has continued. Yet, outside of the justices themselves and a handful of others, neither the public or the media knew about the custom. Then, a few years ago, Judge White learned of the tradition and made a formal request of the court that it supply him with a copy of the signatures on the Harlan Bible. The court complied with his request, and the signatures, reprinted above, are now available for all to see. One of the ironies of the Harlan Bible is that while the Supreme Court was systematically removing the Bible, the Ten Commandants, and prayer from the public square, each member of the court was secretly signing the Harlan Bible. 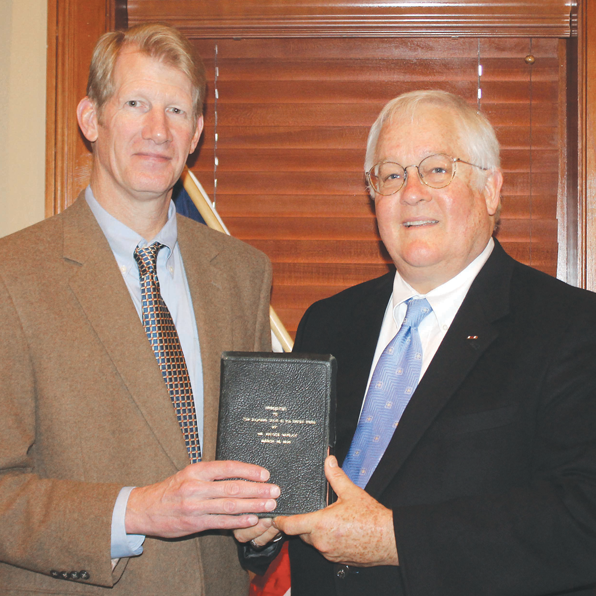 Judge White is chairman of the American Judicial Association, which presents replicas of the Harlan Bible to judges throughout the country. To contact Judge White, email dwhite @retiredjudges.org.